At Mokumeganeya, you can place your order in-store or via email. Please check the options below and select your preferred order method. First choose a design sample that comes close to what you are looking for. Design samples and ideas are provided online and in our free product catalog for your perusal. Each design comes with a description of its background and the metals used in the composition. When you have selected your design sample, please contact us via email at: english@mokumeganeya.com. We will suggest a design based on your wishes. If you have a picture or an illustration in mind, please include it. We will conduct a design meeting on the basis of the information you have provided. Once we have settled on the final design in the design meeting, we will send you a formal quotation. When you are ready to order, please sign and return the purchase order form to us. Payment is required via PayPal or bank transfer within a week from the day you send us your purchase order. We will begin production on the day we confirm receipt of your funds. 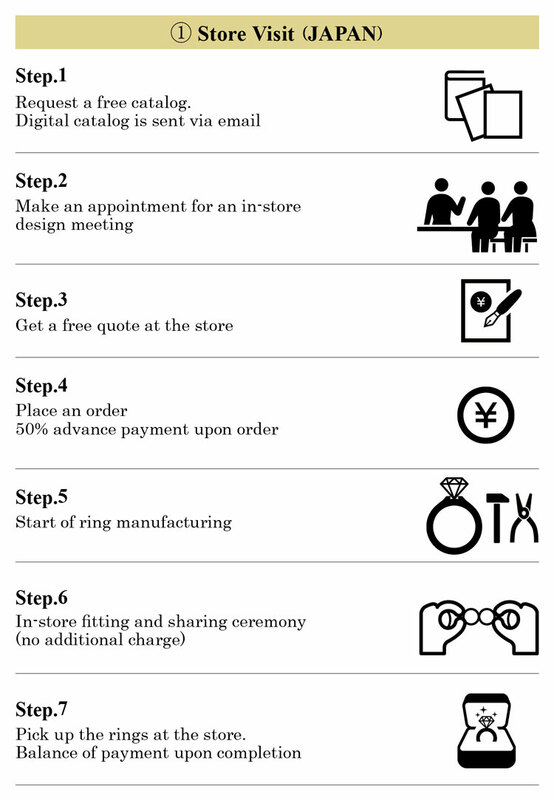 We will do a fitting in-store for customers who can visit in person in Japan. We will also conduct the Sharing Ceremony on this occasion. If you are unable to visit us in-store, we will deliver your order by FedEx or UPS courier service. At Mokumeganeya we offer customer service in English. In the design meeting, we can discuss your preferences and the characteristics of the unique wedding bands in details. 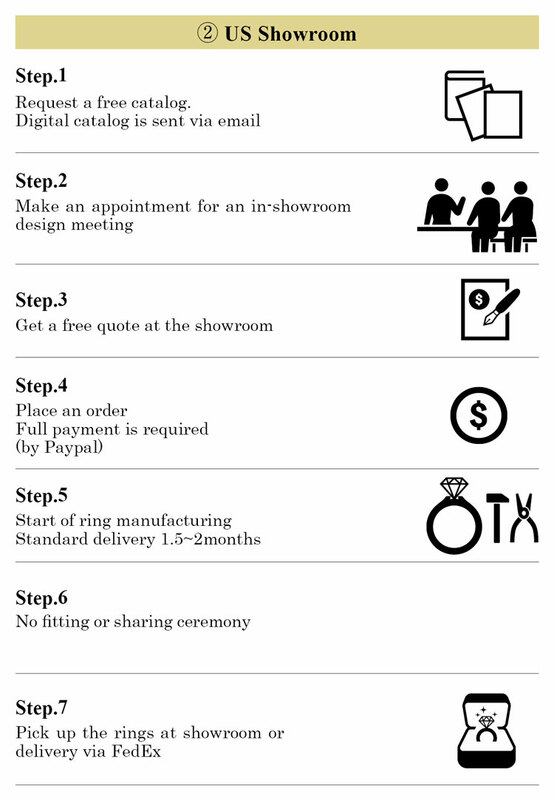 In order to create the perfect one-of-a-kind ring for you, we are pride of ourselves on impeccable service, paying utmost attention to listening to your wishes and discussing ways to make them a reality. Furthermore, we endeavor to take perfect care of you every step of the way. If you have any concerns, please do not hesitate to ask questions. 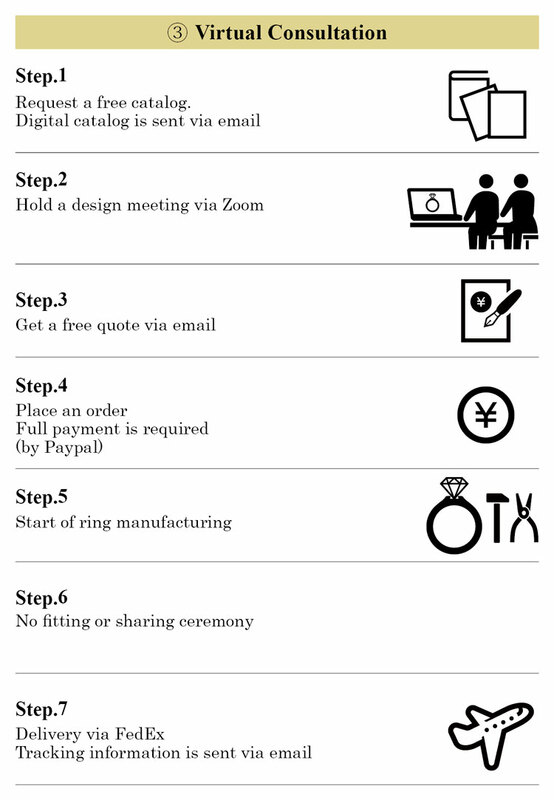 We are highly experienced in delivering rings to our valued customers. Please check our customer stories, which are a testament to our service promise. First, browse our product pages and catalog sample designs to find something that appeals to you. We await your enquiry.